The modern Jeep Wrangler is descended from the World War II-era Willys MB U.S. Army Jeep. There are varying explanations for the origins of the word “Jeep,” including army slang and a character in a Popeye cartoon. In 2013, Jeep rolled out three limited editions of the Wrangler: the military-styled Freedom Edition, the super-tough Moab Edition, and the Rubicon 10th Anniversary Edition. The four-door Jeep Wrangler (2007-2013 models) received good ratings in the frontal crash tests performed by the Insurance Institute for Highway Safety, and marginal ratings in the side-impact tests. Watch the Jeep Wrangler crash test video here. Jeep traces its roots to the early years of World War II, when a car company called Willys-Overland Motors developed the Willys MB: a four-wheel-drive vehicle for the U.S. Army that was, as WWII reporter Ernie Pyle said, as “faithful as a dog, as strong as a mule, and as agile as a goat.” Willys made Jeeps for civilian use — the first sport utility vehicles — after the war. The Jeep brand was bought by Chrysler in 1987. 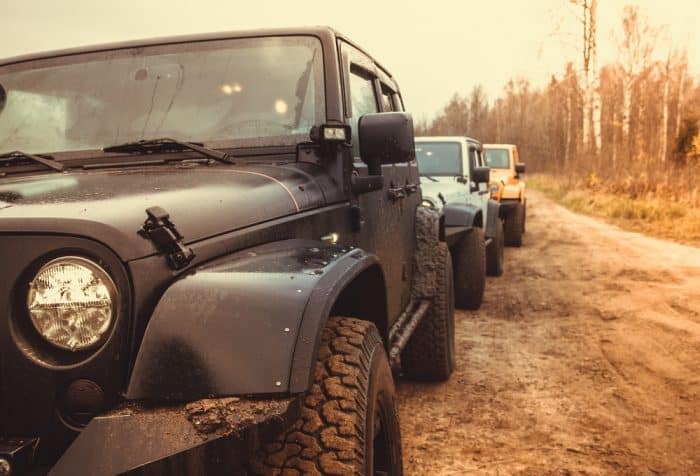 Today, Jeep makes several popular SUVs, such as the Jeep Cherokee and the Jeep Liberty, as well as the beloved Wrangler. The 2013 Jeep Wrangler is available in a wide array of models, from the basic Sport to the decked-out Sahara. Basic really does mean basic; the Sport Wrangler has manual locks, a manual transmission (as do the other Wrangler models) and no air conditioning. The 2013 Jeep Wrangler Sahara ups the comfort factor, with an Alpine premium sound system and optional leather-trimmed and heated seats. Jeep buyers also have their choice of soft top, hard top or color-coordinated top. While you won’t see any Wranglers on the racetrack, owners love to take their Jeeps out for a little adventure. Every year, Jeep sponsors two-day Jeep Jamborees around the United States where owners take their Wranglers on guided off-road trips and learn how to navigate tough terrain. Serious Jeep Cherokee and Wrangler racers compete with custom-modified vehicles in the Jeepspeed race series. The Jeep Wrangler is no fuel sipper. Small though it may appear next to other SUVs, the 2013 Wrangler gets 17 miles per gallon in the city and 21 on the highway.